Were you at CastExpo 2016 with the SF team ? We believe CastExpo is all about the people ! This article gives you some insights on how SF business will be expanding with the awesome people we met at CastExpo 2016 in Minneapolis, a major industrial event held every three years. Can you recognize the SF team on the picture below? 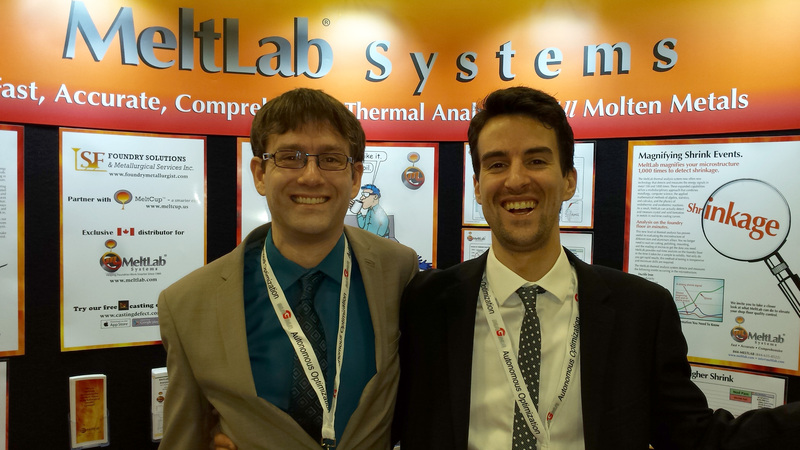 Picture from left to right : Yohan Tremblay and François Audet, the two SF metallurgists having a good time at the MeltLab booth. Here are three highlights of SF business development at CastExpo 2016. Part of Foundry Solutions & Metallurgical Services Inc. is about distributing great technologies provided by great ( see outstanding ) people from the industry. SF metallurgists’ casting expertise then act as a glue for these technologies, allowing for an outstanding service to the customers. MeltLab is the leader in thermal analysis technologies for iron, aluminum and all other metals. That is why SF distribute MeltLab. In 2016, we are introducing the MeltCup for iron (see www.meltcup.ca) . This new iron sampling cup will save hundreds if not thousands to foundries while providing more accurate results. 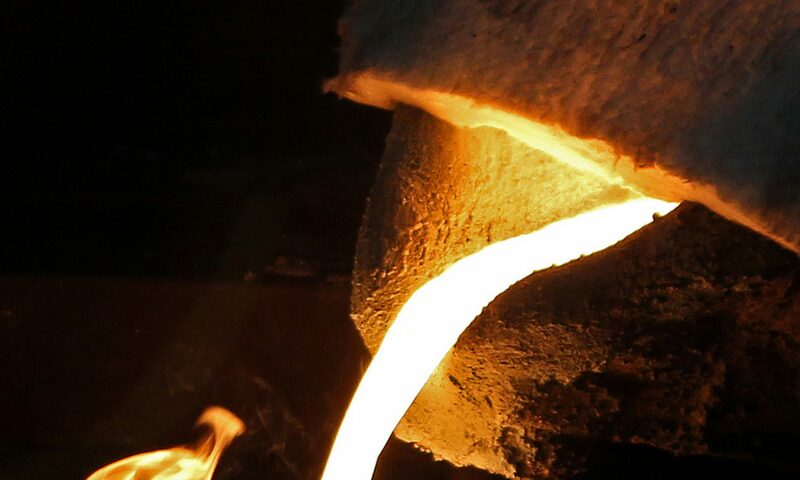 In foundries, SF use Meltlab thermal analysis to check the metallurgical properties of the melt. If the properties are good, we know we need to work on another aspect of the casting process, like the sand or the gating system. Furthermore at CastExpo 2016, SF met with the people of Finite Solutions Inc. These are the gentlemen behind the leading casting simulation softwares Solid Cast, Flow Cast and Opti Cast. It’s not a secret that David Schmidt from Finite Solutions and David Sparkman from MeltLab are good industry friends since more than 25 years and this is a good for business. Finite Solutions provide a technology perfectly in line with SF business model, and vice-versa. For example, in the course of SF services provided to foundries or assembly conversions to casting services provided to machine makers, SF can use Finite Solutions computer simulations to make sure the casting, gating and feeding design are appropriate. It all makes a lot of sense. Several customers will see the benefit of buying the software, while others will benefit from buying one-time simulation services. Last and not least during CastExpo 2016, SF team was invited by the outstanding team of MMEI ( Molten Metal Equipment innovations ) at the 50th floor of the Marquette tower ( http://www.mmei-inc.com/ ). WOW ! What an incredible time we had together ! We are thrilled for further developments between SF and MMEI in Quebec and Ontario, and beyond in Canada ! MMEI build the best equipments of the industry for light alloy processing like degassing systems and replacement parts, pumps, their famous ScrapEater, machined graphite, etc. Stay tuned for more on how MMEI equipments and SF services will team up in 2016! Really, thank you for a great CastExpo! At SF, we believe we can do great business with partners when there are three elements in synergy: great people ( to enjoy working ), great technologies ( to keep learning) and great profits ( to stay in business ). For us, great people is the priority. We feel so grateful to be in touch with such great and outstanding people from the industry ! Thank you ! Next article will be on converting a welded assembly to a casting.